If a picture is worth a thousand words, then a manufactured home (MH) video tour can be worth millions of words. We love sharing the stories of those who live in modern manufactured homes. The stories about those professionals who work in the MH industry day-by-day are equally important for the home-shopping public to see and hear. UMH Properties’ Model Home Village at Port Royal in Belle Vernon, near Pittsburg, PA.
Video interviews are a great way of telling those true-to-life stories. In this Inside MH Road Show video, you’ll see one of those homes from the model home village and design center we showcased for you recently. See that custom MH design center video, linked here. 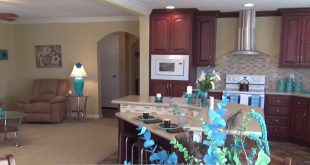 This video is from the UMH Properties’ Port Royal Model Home Village, located in Belle Vernon, near Pittsburg, PA. It should be self evident that almost anyone can live a better life when their housing costs less. When you spend less on your home, you will have more for retirement, travel, education, shopping, charities, faith, or almost anything in life. There is a growing awareness that the U.S. must do something different to address the ever-growing need for quality, appealing and affordable living. Eighty-five percent of renters in a National Association of Realtors’ (NAR) survey said they want to own a home. There are tens of thousands of companies in manufactured housing. UMH Properties is one of them. When an already large firm doubles in size during the last five tough economic years, they deserve some special attention. A glimpse into the living area and part of this chef’s delight kitchen. See more in the video on this page. There are tens of thousands of MH Communities that may appeal to a particular home shopper. As a publicly-traded company on the New York Stock Exchange, UMH is one of few American MH Community operations that gives home owners the opportunity to invest in the firm’s stock. Check out the interview and tour of the new UMH Properties Model Home VIllae and Design Center. We brought you the story recently of a financially capable engineer who could have decided to buy most any home he wanted. Smitty Miller sold a 4000-square-foot custom home on a large home site with a nice swimming pool. Smitty’s story of why he chose a new manufactured home in a UMH community is told at the video link here.